Attention: inconsiderate man-baby drone enthusiasts everywhere—your aerial shot of an immense inferno should never, ever stand between firefighters and their ability to extinguish a fire. Unfortunately, the Los Angeles Times reports that some dronebag in California did just that. A fast-moving wildfire exacerbated by four years of drought conditions, high winds and dead trees jumped over onto Interstate 15 in San Bernardino County’s Cajon Pass. 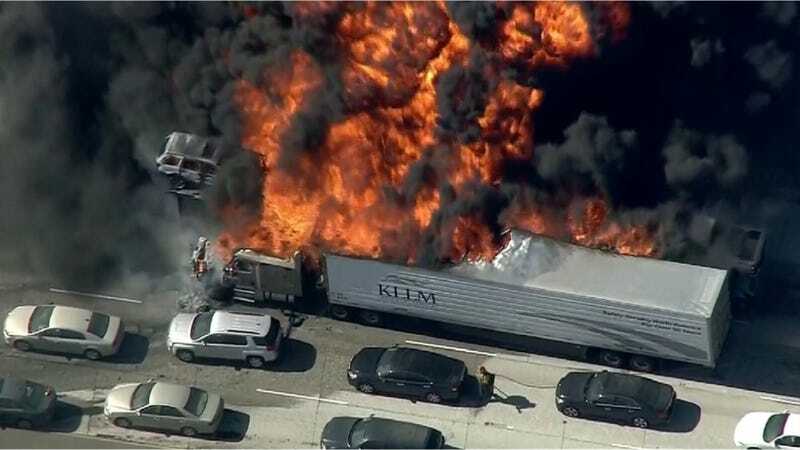 Several vehicles were ignited in the process, forcing drivers to flee from dozens of vehicles stopped near the fire. This isn’t the first time a wildfire has hopped a freeway. The Los Angeles Times reports that it’s actually a common occurrence, citing a 2003 fire in the San Bernardino National Forest that jumped California 18. That’s right: not even concrete can keep a raging wildfire at bay. Be thankful the next time you’re sent on a detour around a fire zone—it’s for your own good. The Los Angeles Times reports that the wildfire has consumed over 2,000 acres, threatening homes in the Baldy Mesa area. An evacuation center has been set up at the Serrano High School in Phelan, Cal. Traffic was especially bad on the pass as travelers head to Las Vegas for the weekend. The fire has closed two southbound lanes as well as one northbound lane as it continues to burn. And of course, someone with a drone had to get in the way. Can we please keep our low-flying devices out of harm’s way? Local news station KUTV has a live stream of their fire coverage here. Update [8:47 p.m.]: The Los Angeles Times added an update that this is the third time a drone has come between firefighters and doing their jobs this summer. Additionally, the wildfire has now burned over 3,500 acres, destroying a total of twenty vehicles and damaging ten more. 60 to 70 cars were abandoned on Interstate 15. As of 8:30 p.m., no one had checked into the area hospitals from the blaze, so it is unclear if anyone was hurt by the fire. The cause of the wildfire is unknown. Here’s hoping that’s not your new car that was formerly en route.